True. At times the sun is too hot, and this is the time of the year when it’s in full prowess. Although the sun goes behind the clouds, it’s no less potent to harm your skin even at those times. But you can escape the harmful effects of the sun by wearing an effective sunscreen. Here we’re discussing the importance of wearing sunscreen. Also provided are tips on how to best use your sunscreen. Contrary to popular belief that being brown-skinned we Indians are at an advantage, everyone’s skin and eyes can be affected by the harmful rays of the sun. Although the darker among us are less likely to get life threating skin diseases caused by sun exposure, the threat of general sunburn, skin tanning, freckles, premature wrinkles and patchy pigmentation exist for everyone, including men. The use of sunscreen is one of the keys to youthful-looking skin and should not be a season based option. Sunscreen should be used all year round to gain adequate protection because sun damage accumulates over time. 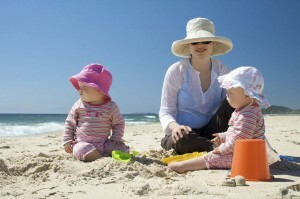 SPF 15 or higher is best to use for everyday use while SPF 30 or higher is more suitable for extended outdoors periods. A sunscreen that contains UVA++ is good to use because SPF is only an indicator for UVB, not UVA. If your makeup application routine cannot accommodate a sunscreen, buy makeup products that already have SPF factor in it. As with other quality skincare products, for sunscreen too it is vital how you use it. For a single face application, the size of your fingertip is ideal. But really there’s no such thing as too much sunscreen! Sunscreen should be applied to dry skin and at least 20 minutes before venturing out. Dermatologists recommend liberal application of sunscreen over all areas of skin that will be exposed to sunlight – your ears, neck and shoulders. Reapply every 2 hours particularly if you are out in the sun for long periods. Men who avoid sunscreen are equally vulnerable just like women and risk getting sun damage, which may result in redness and irritation. Alongside maintaining a good skincare routine, men must use sunscreen that contains SPF of 30 or higher. While best skin habits such as using a gentle cleanser to hydrate, using quality shaving products to avoid skin drying and daily moisturizing will make the skin attractive, use of sunscreen will ensure a shield against harmful sun rays.